Eutelsat confirms full restoration of services from W2 satellite on capacity on three satellites at 16 degrees East including EUROBIRD(TM) 16 and SESAT 1, as W2 is placed in secure standby mode for investigation of anomaly. Arianespace and European Space Agency executives sign contract defining Arianespace’s support services for the qualification campaign and testing of the Vega light launcher. Israeli satellite fleet operator Spacecom leases Amos 5i, formerly Asiasat 2, and signs with SpaceX to launch a satellite, probably Amos 4. Newtec FlexACM is used by Gateway Communications’ Aftrica-wide Internet backbone service to double satellite link capacity. 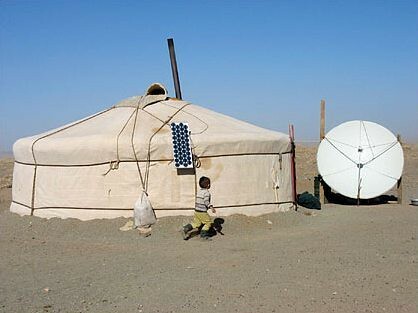 Telesat sells Telstar 18 broadband capacity over Mongolia. Sirius XM to broadcast Super Bowl in 10 languages, with 14 different live broadcasts plus live talk programming from South Florida throughout Super Bowl Week. U.S. Air Force is concerned about vulnerability of satellites, especially GPS satellites, to threats like the capability it believes China is developing, to attack American military satellites. It is proposing to use high flying aircraft, UAVs, or blimps to take over communications duties. Eutelsat confirms that its W2 satellite suffered a technical anomaly on January 27, and is proposing alternative capacity to all customers affected by the anomaly. Intelsat General is awarded five-year contract to provide C-, Ku, and X-band capacity, earth stations, terrestrial backhaul, and bandwidth management services to U.S. Space and Naval Warfare System Command division. Globecomm Systems announces that rural Pennsylvania and Nebraska wireless operator Indigo Wireless is latest carrier to use Globecomm’s 3G switch platform. Hughes Network Systems announces successful demonstration of SPACWAY 3 broadband capabilities during Coalition Warrior Interoperability Demonstration, including successful demonstration of HD video teleconferencing. SES WORLD SKIES reaches new DVB service deal wiith Microspace to deliver global retailer’s digital signage campaign to clothing stores throughout Europe. The Indian Space Research Organisation (ISRO) receives several proposals from the international community for payloads to be carried on its Chandrayaan-II moon mission. America’s first commercial spaceport, Spaceport America, starts to take shape in New Mexico’s desert. University of Colorado at Boulder is selected along with Montana State University and Kentucky Space as universities to have research satellites launched in November as part of NASA’s space-education initiative. RRSat launches new platform for Iberian market on Hispasat satellite. Program support for first ever International Conference on Orbital Debris Removal, co-sponsored by DARPA and NASA, bringing together 300 scientists and researchers from around the world, is provided by Agilex. India plans manned space mission in 2016. Proton carries Russian defense ministry satellite aloft; satellite will relay communications between troops and military commanders. NASA’s plans to return astronauts to the moon, along with rockets designed to take them there; may be dead if Obama gets his way. Anianespace to launch first ten Galileo satellites. SES ASTRA signs with Italian public broadcaster Rai to provide satellite capacity for the broadcast of Rai’s new theme-based channel throughout Europe. Russia working on new booster rocket; said it should be completed by August. Russia set to launch manned spacecraft in 2017; will start building its new space center, Vostochny, in the country’s Far East in 2011 for completion by 2018. Iridium offers satellite data links for management and recovery with remote communication network sites. 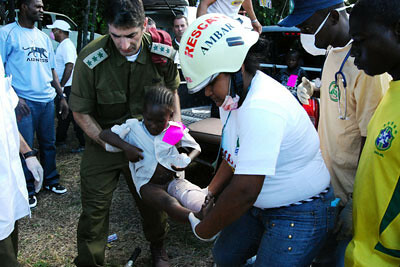 Telecomes San Frontiers, supported by the European’s Commission Humanitarian Aid Department, provides high speed connections and services to over 200 humanitarian organizations in Haiti. Looming China challenge to America includes capability to disable American military satellites. Thales Alenia Space is awarded contract to provide ESA Galileo system support services from 2010 through 2016. Satellite Industry Association finds that during the Iraq invasion over 80% of all military satellite communication was over commercial satellites; U.S. Navy plans to deploy 200 high capacity terminals designed to communicate over commercial satellites. India’s new cryogenic rocket engine develops problems, delaying the debut of India’s most powerful rocket for launching geosynchronous satellites. Inmarsat global phone, the new IsatPhone, successfully makes its first call. RapidEye announces completion of baseline image campaign covering Helmand river basin in Afghanistan to assist U.N. and U.S. efforts to suppress production of opium. Americom Government Services works with MTN to provide additional satellite capacity to U.S. Navy to improve communications into Haiti within hours after earthquake. Satellite communications providers experience dramatic increase in demand from agencies and organizations deploying to Haiti. GATR Technologies sets up internet cafe in Port au Prince, Haiti. Harris selects Telesat’s new Telstar 11N to provide Atlantic Ocean region coverage for Harris Maritime Communications Services maritime broadband product using iDirect platform. SES building three new satellites, to be named SES-1, SES-2, and SES-3, and will rename other satellites in the SES fleet using the same convention. Rockwell Collins, through its recent acquisition of DataPath, wins three-year $9.2M contract to provide maintenance and field service for Air Force’s Ramstein Air Force Base teleport. 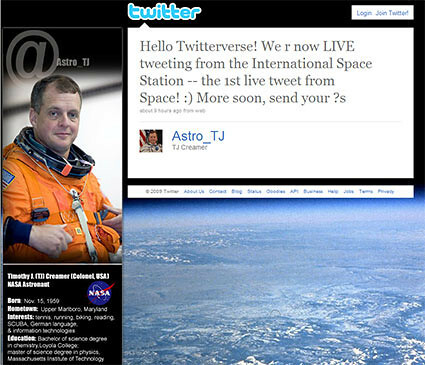 NASA extends the World Wide Web into space, as astronauts gain direct personal access to the Web via the ultimate wireless connection; astronauts make first direct space twitter. NASA plans to boost speed of deep space communications by fusing together three old networks into a single, much faster, more efficient data network 50 times faster. European Space Agency expects to finalize plans for proposed data relay satellite system and get it funded in 2010. Iridium unveils smaller, lower-cost data transceiver, a full-duplex short-burst Data (SBD) transceiver for growing asset tracking and monitoring market. KVH makes an iPhone app available to boat owners to interface with the TracVision Antenna Control Unit for status of their KVH TracVision DirecTV HD downlink system. 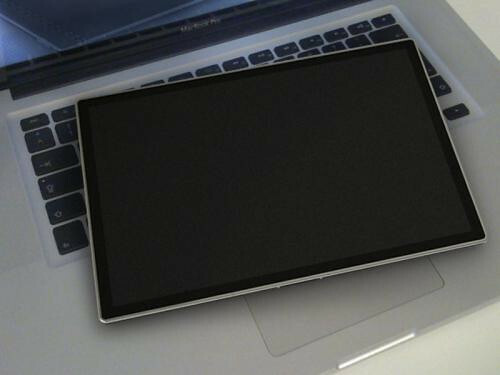 Nice job of rendering the new iPad by Dustin Curtis. We suspect it’s quite accurate. The user interface is what gives the iPhone — and soon the iPad — its universal appeal. Techno adults and young children get how to use the icons/apps right away. And we love it. What a difference it makes. Sure, apps are just a bunch of code and scripts, but people love them. Simple and intuitive. This renders all other operating systems into the stone age. Brilliant. So, as Apple is about the turn around an entire industry, we wondering whether it will one day have one more "killer app." How about live TV? Today’s New York Times (print edition, ironically published on their Web site last night) gives us a comprehensive piece on what we’d expect to see on 27 January 2010, when Steve Jobs takes the stage in San Francisco. With the App Store, people just might get comfortable with paying for premium content. Some already have. 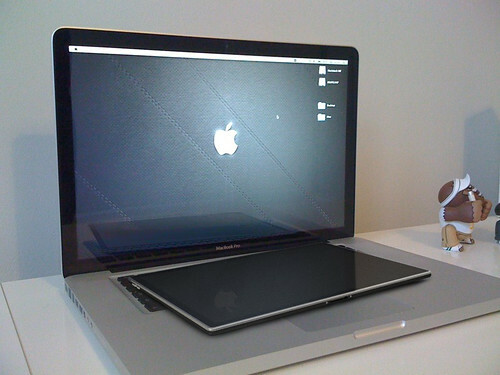 Word has it the iSlate will have more room for various antennas (maybe a push-button one, too). Toggling between WiFi and 3G is simple, so why not add a few more? Use some of the broadcast spectrum for live local TV reception? Add an S-band antenna for live audio or video from an orbiting satellite? Or use Qualcomm’s Flo TV infrastructure. SES tried it two years ago and it worked nicely, but then went and killed what it was based on: the IP-PRIME platform. Sirius XM is broadcasting video using S-band, and Solaris Mobile is trying it in Europe — but satellite reception needs a clear line-of-sight (duh). If the satellite operators had a little more vision, perhaps they’d take a chance on co-developing a model for their paying customers (TV networks, both broadcast and cable) to really make something innovative. TV stations apps are out there, and streaming live TV is possible — although not at the scale required for mass audiences. But if we’re to tap in to the existing RF model of VHF, UHF and satellite, why not give it a go? Let me add a couple other thoughts. There are many that think that video over the internet will “set them free” from having to deal with a small number of big companies (think cable, telco). . If that is what you think, you better think again. There are maybe 3 companies that can stream to 1mm or more simultaneous users. Google, Limelight and Akamai. And that 1mm simultaneous users isnt just for your content. That is for EVERYONE’s content and they cant get much beyond 2mm without big problems. More importantly, if you want to stream your content to millions of users at once, its going to cost you an incredible amount of money. Which leads me to a lesson for all you netizens who are jazzed up about over the top video. If you really believe the demand is there and your content will command 1mm simultaneous users , its probably cheaper to pay Directv, Dish Network and Comcast to create a channel for you and let your viewers watch it on tv. Let that sink in. Its going to be cheaper to have the big traditional cable distributors offer your content to viewers than it will be to reach a large audience on the net. Thats for a one time offering. If you plan on doing it more than once or on a regularly scheduled basic, there is no question its cheaper to do it this way. And the picture quality will be dramatically better. In fact, that is probably a great business opportunity for satellite, telco and cable companies. Open up times to bid to offer content over their networks. You want channel 1020 on Directv, its X dollars per hour minimum or the best price bid. 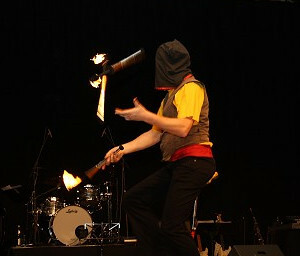 Here is how you provide your content to us. You can buy marketing from us as well. Directv, Dish, Comcast could make a boatload of extra money offering this service. And i can give you one more option. It may be cheaper to go to a movie theater chain and pay them to broadcast the content you want people to see via digital to their theaters. As long as its a slow night and they can sell popcorn, I can assure you it will cost you less than a content distribution network would charge to deliver to thousands of viewers. Maybe someday over the top video will be a realistic alternative to traditional distribution of content, but its not now and its not this year or next or the next and probably not the year after that. By co-developing, we mean lowering the cost of satellite transmission. Expecting 80% gross margins for satellite bandwidth is not a good place to start. Think about it, satcom guys, and call Netflix — they’ll listen. "Hello Twitterverse! We r now LIVE tweeting from the International Space Station — the 1st live tweet from Space! 🙂 More soon, send your ?s"
Astronauts will be subject to the same computer use guidelines as government employees on Earth. In addition to this new capability, the crew will continue to have official e-mail, Internet Protocol telephone and limited videoconferencing capabilities. Broadcast Facilities Incorporated, a media services company owned by the private equity firm Wasserstein & Company, said on Thursday that it had purchased Crawford Communications‘ satellite services division, bolstering its presence on the East Coast. The terms of the deal, which was the first by Wasserstein & Company since the death last fall of Bruce Wasserstein, founding partner, were not disclosed. But a source close to the transaction told DealBook that the sale was valued at more than $100 million. Buying the Crawford division, which provides services like television origination, and production and satellite uplink equipment, will build upon B.F.I.’s existing Andrita Media Center, a big television and online media production facility on the West Coast. Among the clients of the newly combined company are ABC, NBC Universal, ESPN, MGM and government agencies like the Defense Department. “We are very pleased to bring these two market leaders together to create a company that is ideally positioned to take advantage of current market dynamics, including the proliferation of channels, the transition to HD and the desire of broadcasters to outsource facilities to reduce fixed costs,” Ellis Jones, B.F.I.’s chairman and the chief executive of Wasserstein & Company, said in a statement. Can you still make money as a teleport? We’ll see about that. SES unveiled a brave new branding scheme yesterday for naming its future space assets. As one would expect, the Luxembourgeoise countryside was typically excited beyond imagination. Consistent with its role within SES as the provider of global and American satellite capacity, SES WORLD SKIES, a division of SES S.A. (Euronext Paris and Luxembourg Stock Exchange: SESG), today unveiled its updated strategic satellite fleet development plan, as well as a new naming convention for future additions to the fleet that will leverage SES’ global reach and powerful brand. Three new advanced satellites in various stages of development and construction by Orbital Sciences Corporation are intended to replenish and expand SES WORLD SKIES’ North American fleet and will be named SES-1, SES-2 and SES-3. SES-1 is set for launch in the spring of 2010 and will replace AMC-2 and AMC-4 at the 101° West orbital slot. Further information on launch dates and slots for SES-2 and SES-3 will be published shortly. NSS-14, currently under construction with Space Systems/Loral and scheduled for launch in Q1 2011, has been renamed SES-4. It will replace NSS-7 and provide incremental capacity over the Atlantic Ocean with comprehensive coverage of the Americas, Europe, Africa and the Middle East. NSS-7 will then move to replace NSS-5 at 340° East. The C-band payload of the SIRIUS 5 spacecraft, also under construction with Space Systems/Loral and scheduled for launch in Q4 2011, will be named SES-5 and reside together with the Ku-band payload of SIRIUS 5 at 5° East. Our fleet strategy is focused purely on meeting our customers’ growing demand for telecom, television and government services delivery with the most reliable and advanced satellites that carry the most trusted and financially secure name in the industry. SES WORLD SKIES is embarking on one of the most ambitious satellite deployment initiatives in the industry to meet the strong need for ubiquitous connectivity in virtually every corner of the world. So take AMC-1 at 103 degrees West. It was originally called Satcom H-1, with H being "hybrid," as all the previous Satcoms were either C- or Ku-band. When Americom was a part of GE, Jack Welch asked "why not call it GE-1?" So they named all future birds "GE-something." Along comes Société Européenne des Satellites, buys the Americom division from GE Capital, and renames them all as "AMC-something." I was not the only one who advocated branding all as "Satcom" again (the name dates back to 1976, but never registered as a trademark). Would have been much cleaner then — and today. Really, SES stands for Société Européenne des Satellites. There’s your branding. ViaSat is awarded limited order valued at $14.4M for 41 MIDS JTRS terminals for F/A-18E/F and E-8C Joint STARS aircraft and spares. 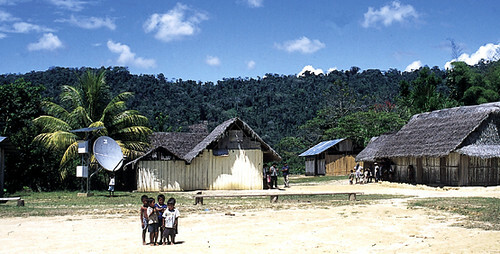 Gilat is awarded a one-year contract extension from the Columbian Ministry of Communications to support certain rural communications projects in the country. 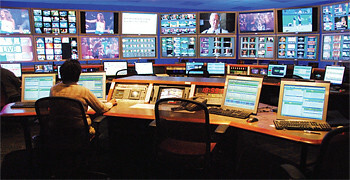 Broadcast Facilities, Inc., a media services company, acquires the Satellite Services Division of Crawford Communications. 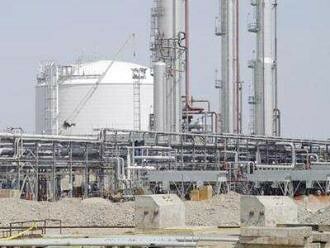 Inc.
Blue Sky Network receives GPS tracking contract from Peruvian oil company Pluspetrol. Comtech EF Data introduces CDM-750 high-speed trunking modem combining DVB-S2, Adaptive Coding and Modulation (ACM), and DoubleTalk carrier-in-carrier technology. Israel Defense Forces team in Haiti sets up $2M satellite-based communications system. SpaceX and Orbital Sciences Corp. do not meet required safety standards to transport NASA personnel for the Commercial Orbital Transportation Services (SOTS) program according to the U.S. Aerospace Safety Advisory Panel. program to route IP traffic between satellites instead of relaying it through ground stations (double hopping). FCC order gives telephone and satellite companies a victory in the pay television market, preventing cable operators from blocking access to some sports programming. Group is formed in attempt to save NASA’s Australian satellite antenna which was used to communicate with astronauts on the moon during the Apollo program. COMSYS announces release of eleventh edition of The COMSYS VSAT Report, a product or 12 months of research and site visits with companies from the world over. Vizada Networks and SES World Skies donate satellite and service capacity to allow the World Health Organization’s VSAT site in Port au Prince to cover for increased communications needs in Haiti. Mission Aviation Fellowship (MFA) missionaries set up GATR VSAT satellite communications system donated by GATR Technologies in Haiti to provide high-bandwidth communications to workers from over 16 international aid groups. SES World Skies announces that NSS-12, at 57 degrees East has entered into commercial service. Norsat’s GlobeTrekker and NewsLink satellite communications terminals deployed in Haiti to offer immediate communications solutions on the ground. China may be ready to launch Tiangong-1, its first space laboratory, in less than a year, yet little is known about the program. Dish Network announces upgrade for its entire ad insertion systems supplied by Seachange, along with migrating to new conditional access technology by Nagravision. 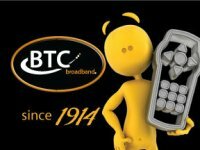 EchoStar announces agreement to provide 49 HDTV channels to IPTV headend of BTC Broadband in Oklahoma. Iran’s Minister of Communications and Information Technology says three new home-built satellites will be launched by Iran on February 3. Iridium unveils its nexgen Iridium 9609 satellite data transceiver with built-in GPS input/output ports to interface with external GPS receiver; unit is smaller and less costly. Russia to orbit Intelsat 16, European Space Agency’s CryoSat-2, and a freighter to the International Space Station with three different rockets next month from Baikonur. Federal Emergency Management Agency is tapped to provide tactical communications for U.S. Embassy and U.S. Agency for International Development in Haiti; Joint Communication Support Element of Joint Forces Command moves satellite-based system to the embassy. EchoStar donates satellite services to Haiti relief agencies. KVH expands mini-VSAT broadband satellite coverage for Internet and voice to Africa. ATCi and Solana HK accounce joint agreement to offer affordable industry broadband satellite and fiber services to underserved markets throughout Asia, Africa, and the Middle East. OmniGlobe Networks announces subsidiary RAMTelecom has been awarded three-year contract by the government of Canada to provide, operate, and maintain comprehensive Iridium satellite services and equipment. International Datacasting Corporation is awarded $5.3M contract to update and refurbish the Public Radio Satellite System. 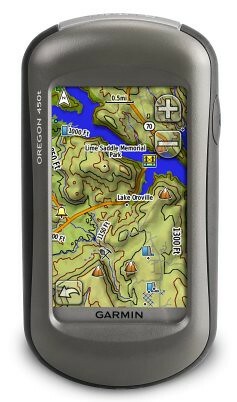 Garmin to offer DigitalGlobe satellite imagery with its service, allowing users of select handheld Garmin GPS navigators to load highly-detailed photo-based maps. Europe’s new Vega small satellite launcher may not have its launch debut until 2011 because of potential delays in development of ground systems in South America. China successfully launches its third orbiter for its independent global navigation network. 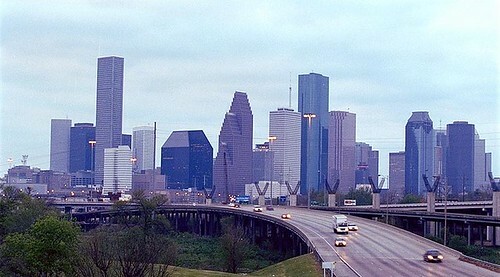 MTN Satellite opens office in Houston, Texas area to service customers operating in Gulf of Mexico. Intersputnik signs long-term contract to lease 16 transponders from Eutelsat on Eutelsat W7 for its entire in-orbit life. iDirect’s December announcement that SpaceCom International deployed a GSM cellular backhaul based on iDirect’s satellite communications platform in Afghanistan is examined in NSR Report. Us rocket scientists and satnuts know that to get a signal from an orbiting spacecraft, the satellite antenna must be pointed directly at the satellite, without obstructions between the two. This means no trees and no buildings. Generally, you ought to take into consideration future tree growth, house remodeling or additions and new construction.The satellite signal will not pass through leaves or branches — or houses and buildings. The satellite is always located south of Texas. That means if you live in Miami, you must have a clear line of sight to the southwest; if you live in San Francisco, you must have a clear line to the southeast. How High Up in the Sky is the Satellite? 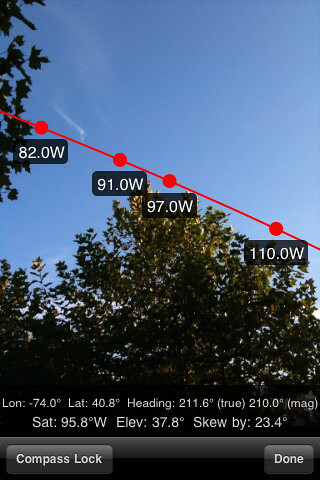 Depending on where you live, the satellite will be at an elevationangle between 30 and 60 degrees. Southern states point more toward 60 degrees; northern states point more toward 30 degrees. Elsewhere, the guide suggests you use a map. In Europe, ASTRA’s installation assistant does a decent job of taking you through the process. For most, taking the free installation (see DISH Network) is a good idea. Before you go out and buy a $500 BirDOG gadget, better make sure you can see the satellites. The Flash animation on ASTRA’s site can help you when you’re in the field, unless you calculate your look angle ahead of time. On-site and need help with your site survey? There’s an App for that (both for iPhone and Android). I’ve got one location where the trees grew since installation, so this has ongoing practical use. DigitalTrends selected it as one of the best augmented reality apps. If guys in Afghanistan can use it, so can you. "Telecommunications Without Borders" — the NGO that’s typically first to arrive at disasters with emergency communications technology — deployed its teams in Haiti within a couple of days of the devastating earthquake. Using Inmarsat’s BGAN terminals, they were part of many "satellites to the rescue" stories in the aftermath. 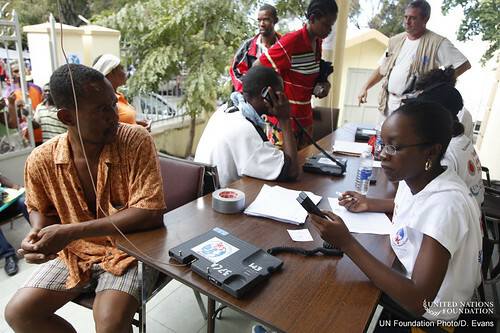 Telecommunications experts from Télécoms Sans Frontières (TSF) and the World Food Programme (WFP) have been setting up communications networks in Haiti for the government, aid agencies and survivors of the 12 January earthquake. TSF is funded by the UN Foundation and Vodafone Foundation and is working in co-ordination with UNICEF and the United Nations Disaster Assessment and Coordination teams (UNDAC). The first TSF team arrived on Wednesday 13 January and a second team flew into Port-au-Prince from Santo Domingo with a UN rescue aircraft on Friday 15 January. TSF has set up a satellite link, mostly dedicated to UNDAC teams and to emergency responders, and multiple broadband access points for phone and Internet use in the co-ordinating and logistics centres near the airport. 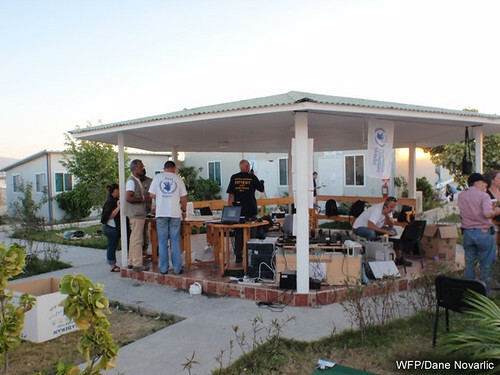 TSF teams are also providing IT support to the nustah (United Nations Stabilization Mission in Haiti). This complex, located close to the airport, gathers all United Nations agencies and NGOs. 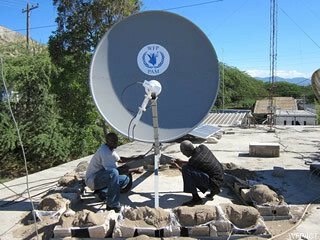 By Saturday January 16, TSF had set up three ‘humanitarian’ phone call operations around Port au Prince, allowing local people to phone relatives — 100% were international calls, mostly to the U.S.
Obviously, the dominant satellite operators made satellite capacity available quickly, with dueling press releases from Intelsat and SES World Skies. But Eutelsat, the only geo satellite operator affiliated with TSF, was first on the scene. A six-man team from TSF (Telecoms Sans Frontières) has already deployed a D-STAR terminal at the On Site Operations Coordination Center (OSOCC) of the United Nations Mission to Haiti near the airport in Port-au-Prince. It is at the disposal of OCHA, the United Nations Office for the Coordination of Humanitarian Affairs and also the EC (ECHO). The satellite link is provided by ATLANTIC BIRD™ 1 and the Skypark teleport in Turin which is patching the terminal into the Internet backbone to provide DOIP and VOIP services. Satellite capacity is beneficial, but getting the links up and running — and communicating via the Internet — is critical. They ought to consider shipping modems and antennas. SES has a SurfBeam platform on AMC-9, but the coverage of Haiti is weak, so shipping these low-cost DOCSIS-based modems may not be the best idea. AMC-6, with an iDirect platform, does offer better coverage — but the TDMA-based modems cost much more. So what? Send them out — with pre-configured link budgets, including look angles/pointing instructions for a selection of locations in Haiti. Look, you got the good P.R. already. Make it better with more telecom donations. I’m just sayin. Hey, you could do worse. 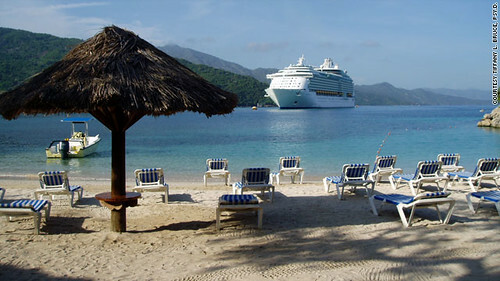 Look at Royal Caribbean.